So... I didn't dream up these gorgeous rolls. But they're such an awesome idea that when I saw them on Pinterest a couple of weeks ago I knew I had to figure out my own way to make them. (You know how I love to figure out how to make things from scratch...) The original recipe called for refrigerator biscuits and velveeta, and I just couldn't bring myself to use either one. I turned to my all around favorite quick roll recipe, and it did not disappoint! They're crisp on the outside, gooey on the inside, and have that buttery cheesy taste I love in a grilled cheese sandwich. Plus they're quick to make! 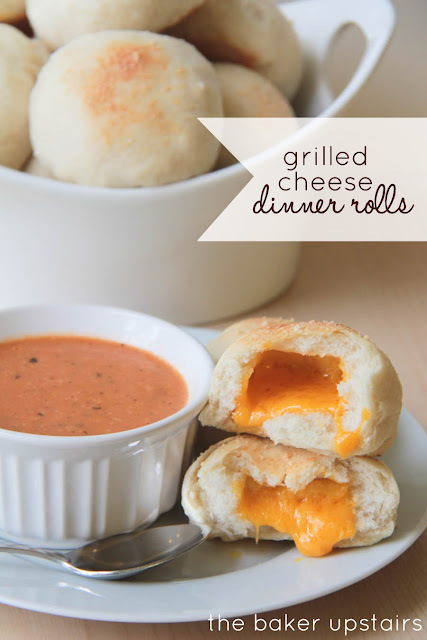 You can have hot cheesy rolls on the table in less than an hour. They went perfectly with a warm bowl of tomato basil soup, and the whole family loved them. So delicious! In a large bowl or the bowl of a stand mixer, mix together water, yeast and sugar. Let stand until bubbling, about five minutes. Mix in oil, salt, and flour, until a smooth dough forms. Kneed until smooth and elastic. Place the dough in a greased bowl and cover with plastic wrap. Let rise until doubled in size (30-45 minutes). Preheat oven to 375. Lightly grease a 9 x 13 baking dish. Divide dough into 12 equal sized balls. Flatten each ball with the palm of your hand, then wrap it around a piece of cheese, sealing the edges. Place seam side down in the baking dish. Brush with butter and sprinkle with parmesan cheese. Bake 13-15 minutes, or until lightly browned on top. Serve warm. Drooling on my iPad...can't wait to try these! These look AMAZING, Alicia! Can't wait to try them!